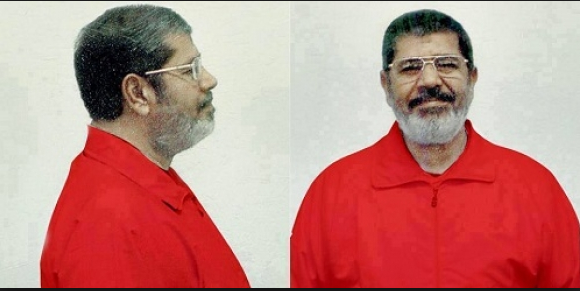 Muslim Brotherhood, Mohamed Morsi the former head of Egypt has a full criminal record of espionage, high treason, terrorism and killings. 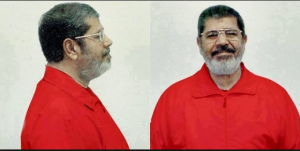 On 16 May 2015, the criminal court sentenced Mohamed Morsi and others to death penalty in the case known as “escape from Wadi Alnatron prison during the 25th of Jan 2011 events”. Mohamed Morsi and others committed several crimes and this is why the court was reassured of all evidences and witnesses testimonies, whether defense witnesses or prosecution witnesses. Mohamed Morsi and other defendants committed kidnapping and killing crimes of Egyptian police officers: Mohamed AlGohary – Sherif Almaadawy – Mohamed Hussein and Walid Saad. These officers were detained and killed in Gaza sector. 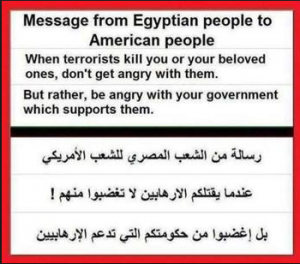 Muslim Brotherhood and others were also condemned of carrying heavy weapons in resisting the Egyptian authorities. In addition, to their hostilities acts against the independence, unity and the national security of the Egyptian territories. Killing and attempted to kill Egyptian soldiers and officers from the police and military. Breaking into prisons, burning prisons and facilitating the escape of dangerous criminal and terrorist elements. 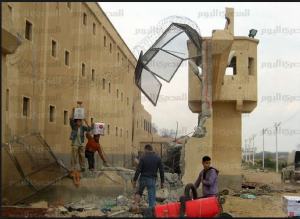 Burning and breaking into governmental buildings and vital police buildings and the theft of police ammunition weaponry. Who was also sentenced to death in this case? The other defendants in this case are defendants from 1 to 76, who coordinated, facilitated and participated with about 800 others from Hamas Gaza terrorist movement and Hizbu-llah of Lebanon and some Jihadists from Sinai, who launched terror attacks in different cities in Egypt (North Sinai – Cairo – Kalubia – Munufiya) during the 25th of Jan chaos events. They deliberately committed acts that endangered Egypt’s territories, like launching and firing RBG shells, intensive fire shots in all the borders areas from the east side with Gaza sector and they also bombed and exploded the borders ambushes, and Gas Lines. The defendants from 1 to 71 and others got into the Egyptian territories through illegal tunnels, and they managed to get into the country in groups and they used SUV vehicles that were fully equipped of heavy weaponry, RBG, machine guns and Grenov guns. The defendants managed to control the border length of 60 Kilometers and they kidnapped the 3 Egyptian police officers, who were detained and killed in Gaza. In addition to destroying, theft and burning vital security and governmental buildings. After this death sentence, Muslim Brotherhood threatened Egypt with escalations, Founder of the Brotherhood without violence movement, Former brotherhood member Hussein Abdul Rahman said that the MB international organization would target Egyptian facilities and launch terrorist operations against the army and police in Sinai.In addition to targeting Egyptian judges. 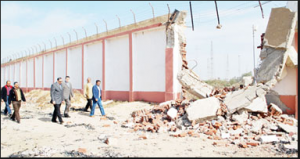 The judges were travelling in a car in the city of Al-Arish, Sinai, when it was attacked by suspected Islamist gunmen. The driver also was killed in addition to one civilian killed and at least three more were injured in the assault. Mohamed Morsi and Muslim Brotherhood leaders have stolen classified documents concerned the Egyptian national security and armed forces from Ethihadeya presidential palace and sold it to Qatar intelligence and Aljazzera. This court trial is still on. The court has already sentenced 20 years jail on the defendant Mohamed Morsi and the rest of Muslim Brotherhood defendants on 21 April 2015, due to the violent event which took place on the 5th and the 6 of December 2012 in front of the presidential palace in Heliopolis Cairo. Resulted the death of 10 civilians and more than 800 severe injuries. The following video is a brief report about the prisons break and the burning of most police stations in Egypt. All prisons break and police stations in most of the Egyptian cities happened in one day and at the same time on 28/1/2011. In the following video you will see the burning and the prisons break. There is also an Egyptian female activist who admitted, that the 25th of Jan is not innocent, of course there was violence and they had to do it to topple the regime and the only way to do this, was by breaking the security arm of the state, and this is why they started streets war all over Egypt. She also said that yes, they participated with others in attacking police individuals, and they also participated in burning prisons, police vehicles who were using just water to disperse them (according to her own words in the video) and they also participated in prisons break. In this video there are people in the streets carrying weapons and using them. Also another activist saying that him and others were trained in Serbia on how to push the Egyptian community to use violence and how to control the brains of people to make them do whatever they want of creating as much chaos as possible. The minute 3.56 in this video, shows clashes between masked armed men and the Egyptian police and Armed forces in Al-Arish city. The minute 4.46 shows breaking into and burning the National security buildings after stealing documents, computers and hard disks, and Egyptian armed forces arresting some of Muslim Brotherhood militia in Alexandria city after participating in breaking into the national security buildings. The minute 6.32 Mohamed Elbeltagy Muslim Brotherhood admitting that Muslim Brotherhood were in a war with National security bodies and they broke into their buildings and they were in a war with Egyptian intelligence too. All these public confessions made by those who betrayed Egypt (6 of April Movement, political activists and what they call the spearheads of Jan 25), was due to Muslim Brotherhood and their mercenaries confidence that no one will ever punish them for all the crimes and chaos they have committed, after they managed to control all country’s joints and reached power. (6 of April admitted publicly that they are the left arm of Muslim Brotherhood, while their right military arm is Hamas).